PETALING JAYA, 21 September 2018 – A slight rejuvenation and a visually more appealing exterior accompanies the new 2018 Jaguar F-TYPE. New design for its headlights, rear lights and bumper enhances the F-Type’s existing contemporary design to match the pure performance of this 2.0L turbocharged Coupé. The F-TYPE Coupé, embodies the uncompromised design vision of the stunning Jaguar C-X16 concept sports Coupé, which debuted at the 2011 Frankfurt Motor Show. 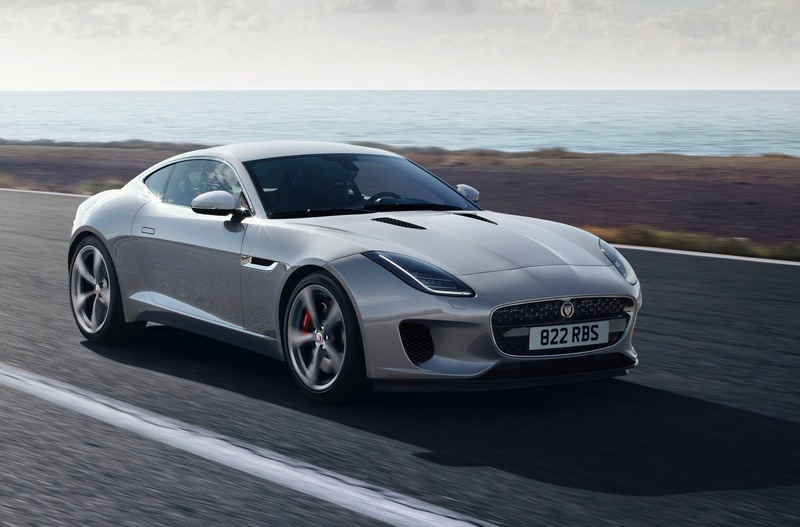 Jaguar’s expertise in aluminium technology has enabled the design vision for the F-TYPE Coupé to be delivered in a lightweight yet extremely strong bodyshell. The Jaguar F-TYPE Coupé is the ideal performance sports car due to its breadth of capabilities to suit the demands of the road and the driver. It is also the latest in its category to deliver both performance and innovative car technology. Its new 300PS 2.0-litre turbocharged Ingenium engine carries with it Jaguar’s sports car DNA with enhanced agility as well as improved efficiency and affordability. This model retains the performance expected from an F-TYPE, and can accelerate from 0-100km/h in only 5.7 seconds and achieve a top speed of 250km/h. The engine’s high maximum torque of 400Nm is generated from just 1,500rpm. A redesigned bumper, a new single exhaust tailpipe finisher and new 18” wheels also gives the F-TYPE a redefined look, adding more masculinity to the car’s personality. The introduction of the new Silicon Silver exterior colour also emphasises the character lines further and exudes the boldness of the F-TYPE. Entering the Coupé, one will notice significant enhancements, aimed at making the car feel even more luxurious than before. Lightweight slim-lined seats and new chrome and aluminium trim finishers heighten the driver-focused feel of the interior and perfectly complement the enhanced interior colour schemes which includes the Siena Tan leather option now available across the range. The seat frames are pressure die cast magnesium alloy – a material that has a high strength-to-weight ratio and excellent formability, allowing for the ergonomic form of Jaguar’s innovative seat design. Weight savings for the Coupé as compared to its predecessors are more than 8kg. Every F-TYPE now features the Touch Pro infotainment system with a 10-inch touchscreen. Its super-fast responses, intuitive tablet-style operation, intelligent navigation functions such as Share ETA and online services such as real-time traffic and live weather reports make every journey more rewarding and put a world of information at the driver’s fingertips. Touch Pro, the most advanced infotainment system to be offered by Jaguar comes standard for the entire F-TYPE range. Designed and developed around state-of-the-art technologies including a powerful quad-core processor, high-speed 60GB Solid-State Drive (SSD) and an ultra-fast Ethernet network, Touch Pro delivers a world-class performance and functionality as well as an outstanding user experience. All vehicles distributed by Jaguar Land Rover Malaysia are compatible with the Malaysian climate, environment, fuel quality and meet the Malaysian emission standard. All Jaguar vehicles distributed by authorised dealers also come with ‘Jaguar Care’ programme which is based on whichever comes first i.e a 5-year Warranty or 150,000km, 5-year Servicing or 65,000km and 3-year Roadside Assistance. Please visit www.jaguar.com.my for more information.